We now know the two teams that are going to be heading to the Super Bowl on February 3. They have been working for the entire season, hoping to put together enough victories to find their way to the ultimate stage, complete with a pop music halftime show and some wonderful commercials (hopefully). Football is a sport that is based on preparation. Coaches develop pretty complicated playbooks, and it is the responsibility of each member of the team to know his job in every possible situation. Even when it seems like a particular player is irrelevant during a certain play, he has a job to do in that scheme. You could be the wide receiver in the left slot, and the play is to send the halfback to the right, but you still have a job to do. It may not be the most important job and not play, but it is an important job. After all, the entire purpose of running plays is to coordinate the members of the squad towards the predetermined end. Even the wide receiver who will never receive a pass to the left on a run to the right may need to pick up a blocking assignment. If it is a halfback draw, he might have to begin to run a route as a type of bluff before the quarterback hands off the ball. The coordinated effort of 11 people on the field makes all the difference, and if they all don’t do their jobs, it is not going to be successful. There are no unimportant players on the field. Therefore, they need to prepare ahead of time. There may be those times when the seemingly unimportant player actually has the most important job on the field. That slot receiver on the left might not have immediate interest in a halfback run to the right, but as the play develops and if the running back is able to proceed into the secondary, that wide receiver might be still moving down the field. He might be in a position to make a key block that turns a 10 yard run into a 25 yard run. Those types of things make a difference even if they do not seem to be immediately applicable. How often do we feel like that slot receiver on a running play? We might not feel like our job matters very much. I’m not just talking about our day jobs. You may feel this way about your day job, but this is a much more wide-ranging conversation. It can be really simple. We can be talking about things like whether or not it makes a difference that I smile and say hi to the person I walk past on the street. We can be talking about things as major as whether or not I should bother trying to go back to a particular college because I feel like I am just a number there. There were all kinds of times when we wonder if we are important. Does it really matter if I am nice to that cashier? She has probably seen hundreds of people today, and some of them were nice while others were not. Does it really matter how I treat her? Does it really matter if I stay at this particular college? Even though I feel like God is called me here, I just don’t feel like I am important to the college or anyone else. Is it really the right spot for me? I would like to suggest that there is a connection in between preparation and significance. An important part of any useful preparation is an understanding of the significance that a particular task possesses. It is important to be nice to people because it makes a difference to them. I should smile and say hi to that person because it may improve his or her day. That is significant. That means that I need to go into that store with the right attitude. I need to prepare ahead of time to make a difference in that person’s day. On the bigger questions, I need to think about why perhaps God might have me in a certain place. I might be at a particular college for a particular reason. However, I need to make sure I have prepared myself to even think about such difficult things. Have I considered why I might be here and what significance I may have on campus? After all, even if I might not feel great about something at the time, maybe I am just upset. Maybe it is just an emotional time. Maybe I need to prepare to make this decision by preparing to think about how serious it really is. It is a heavy decision, and it is one that I should not make lightly. I need to think ahead of time and prepare so that I am ready to make a potentially life altering decision that no one would argue is insignificant. When I think about this issue of significance, I can't help but think of the Old Testament. Why did God give us all the back story? My salvation is not based on doing the history of the Judges. It is a wonderful book of the Bible, but Judges tells me a lot more about the history of Israel and it tells me about Jesus Christ. We say we are Christians, so what does the background information of the Old Testament really do for us? It provides us with that preparation. It helps us establish the type of world that Jesus Christ decided to enter. It points us towards the people group that God had His Son born into. When we read the Old Testament, we are prepared from Messiah. We see a world looking forward toward that Messiah and suffering the consequences of human sin. We see a conflict, and we desire a resolution. We are prepared for that resolution because of what we know. Naturally that is not the only purpose of the Old Testament, but it is an important one. Much like John the Baptist was a forerunner to Jesus Christ, the Magi found Jesus because the scribes of Herod pointed to it Old Testament prophecy about Bethlehem. Even when the Old Testament is not prophetic or directly related to Jesus Christ, it establishes the groundwork. Going further though, it is not just about laying the groundwork, but because of the obvious sinfulness of humanity and the hopelessness of the human condition, we see the significance of Jesus Christ all the more clearly. When set against the background of so much darkness, the light seems all the brighter. Why does the one star in the night sky seemed so bright? It is surrounded by black. Jesus coming to earth would be significant anyway because He is the Son of God, but it seems all the more beautiful and important exactly because of the myriad of ways that we have failed to save ourselves. In fact, the more we try, the more we make our condition worse. Therefore, there may seem to be parts of the Old Testament that don’t seem to matter. Who really cares about some of the obscure characters we meet in one verse? The fact of the matter is that every part of the Old Testament matters. Some parts don't seem to make a difference on the surface, but like that wide receiver making a block down field, they are there for a purpose. God was preparing a story, and He was preparing that story that ultimately pointed towards the most significant life to ever walk the face of our planet. These are just a few examples, but I think you can kind of see my point here. Preparation points towards significance. Like the Super Bowl, these guys have been working all year for this game, and they all have an important job to play even if it doesn't always seem as important on the surface. We can never forget that in our individual lives either. I think that we can easily be tempted to feel like we don't matter or what we do makes no difference. Don't fall into that trap. I'm not some kind of self-help guru, but there is one thing I do know. No one is an important. Therefore, we need to get down to business and do our own jobs. We need to do what we can with what we have to make a difference. We may not immediately see the impact of what we do, and we might never even see within our lifetimes. However, it is important to pursue our God given calling. If we do that, we will be where God wants us to be, and we will be doing what God wants us to do. There is no better place to be than right there. Not just better for us, but it will be better for all of those around us and, of course, the advancement of God's kingdom. North Korea and South Korea are regrettably competing together at the 2018 Winter Olympics, and I do not think that is a great idea. On Monday, I suggested that it makes no sense for such politically different countries to be competing under a shared political symbol. On Wednesday, I suggested that it was not smart for South Korea to present themselves as associated with such a morally problematic nation. I would submit one final thought to this discussion. Despite all of this political theater, nothing is going to change tomorrow. We have seen numerous reports about Kim Jong Un’s sister at the Olympics, and CNN reported how she is “stealing the show.” She looks like a commercial. North Korea is friendly, attractive and happy. All of you on the outside have simply been misinterpreting the intentions of this wonderful nation. Of course this manufactured image is exactly the reason why North Korea wanted to show this unified front with South Korea. They look like the good guys. All of a sudden, they are getting along with South Korea. All of a sudden, the sister of their dictator seems to be playing nicely with other world leaders. Maybe they are turning over a new leaf. This is the equivalent of a McDonald’s running a commercial saying they are a health food chain. We all know is not true, but some people will buy it because they want to believe the marketing campaigns. A carefully crafted image has a way of pushing away doubts because it is what we want to believe. On Monday and Wednesday, I suggested that the average Korean citizen probably wants this to work. They probably want to reduce tensions in the region. I honestly think that most of us here in United States or around the world want this to be true as well. We want to believe that North Korea will all of a sudden become like most other normal, reasonable countries and act like members of the international community. For a country that is so wrapped up in identifying fake news right now, I really hope that most people are able to see through this. Right now, North Korea is marketing to the world. They want to improve their image, so they are getting along with other people. I want to see their actions reflect this new image. Are they going to treat their people better? Are they going to stop acting like a dictatorship? Are they going to stop putting foreign visitors in jail? These are important questions that actually need to be answered, and unfortunately, by including North Korea in these Olympics as part of the unified Korean team, South Korea has encouraged this marketing campaign. They now have propaganda they can spin to make it look like they are changing while in actuality, they may not do anything differently in North Korea. Everything may proceed as it always has been, but North Korea will be able to use this exactly the way they want to. They want to gain favor in the world without changing their dictatorship. The Olympics have a way of bringing people together. This was a boon for them, and I really don’t know why South Korea agreed to help them in this process. North Korea and South Korea are competing under a shared flag at the 2018 Winter Olympics. I do not believe this is a wise move from the South Korean perspective. I suggested on Monday that North Korea and South Korea should not compete together in the Olympics because sharing a national symbol implies political unity which clearly these two countries do not share. Another reason this is not a wise move is a moral reason to contrast with my prior political reason. North Korea is quite frankly one of the worst human rights abusers on the planet today. Like I mentioned on Monday, they have citizens running away to escape because it is so horrendous. With such a brutal, totalitarian regime in power, there is a real question as to whether or not they are somebody you want to associate with. Even if the International Olympic Committee was okay with North Korea competing as their own country, South Korea is certainly under no obligation to associate with their neighbors. Just because they happen to share a peninsula in Asia does not obligate them to allow North Korea to join their delegation at the Olympics they are hosting. The old saying goes that you are known by the company you keep. If I hang out with bad friends who make questionable decisions, people are going to wonder about me. Even if I don’t do anything wrong, the implications of hang out with the wrong types of people are evident in our everyday lives. Again, like I hypothesized on Monday, I think most of the desire to combine probably comes from the reflection of the desire of the average person in North Korea and South Korea. I don’t have a statistic for you, but decreasing the tension between North Korea and South Korea would be good for most people who live in those nations. Because, even though the regime in power is terrible, many of the average North Korean people would probably love to find themselves under a much better government. Again, I don’t have a number for that statement, but I believe it is probably pretty self-evident unless there is some severe brainwashing going on in North Korea. I don’t know how people would live in that state and not desire something better. By agreeing to cooperate with North Korea and compete under the same flag, I fear that South Korea is not forcing them to be accountable for the moral atrocities they commit against their own citizens. If South Korea made this participation contingent on certain promises being made by the North to improve living conditions or do something that would actually benefit the citizens, I would understand that. That would be bargaining, and I think something should be done with that. Sometimes cooperation must be incentivized. If I was the decision-maker in South Korea, I think I would have serious moral qualms about uniting with such a horrible, abusive nation. I don’t see what benefits it brings to them, and I don’t know that it is good to be associated with North Korea. There is a great deal of discussion around the unified Korean team at this year’s Winter Olympics. For some people, it is a wonderful sign of the hope for peace in that region. For other people it is the equivalent of putting a new coat of paint on a junk car that deserves to be thrown out. Undoubtedly, geopolitical issues are highly complicated, and surely there are many layers of thought that went into this issue for both the North Koreans and South Koreans. However, I would like to submit some thoughts to you this week as to why I would not have agreed to this arrangement if I was South Korea. The first reason is rather obvious. It is great that the North Koreans have some athletes that they want to have compete in the Olympics. For those athletes individually, I am glad they have the opportunity to compete. Just like anyone else, they have trained their entire lives to become very good at particular sports. When I say what I am about to say, this is not a personal reflection on any individual athlete from North Korea. The first reason that North and South Korea should not have combined for these Olympics is that North Korea is still one of the worst human rights abusers in the world. Their own people are running away to get to South Korea because of how terrible conditions are in the North. By presenting some kind of false front that North and South Korea are some type of united front is ignorant at the very least. South Korea is a normal country, certainly imperfect I am sure, but reasonably good to its people. By presenting this image that there is some kind of united Korea simply is not reality. While the people in the countries very well might want a unified Korea, the fact that they are marching under the same flag at the very least implies some type of shared national identity. This is not a statement made at the level of individuals in North and South Korea. This is a statement made by leadership at the country level. I assume that a large part of the rationale to march under the one Korea flag was to hypothetically reflect the will of the normal Korean person who wants tensions to be reduced in their respective countries. I would want that too if I was a Korean citizen on either side. However, the raising of a united flag is a political gesture, and when we are talking about international relations, we need to think on the level of national policy. Thinking about this from a different perspective, I suppose the argument could be made that North and South Korea competing together is very much like the former Soviet Union were multiple nations were combined into one conglomerate entity. However, they actually were under the same regime. They were members of the Soviet Union, so there were shared political ideas that united them and made it appropriate to follow under the same manner. 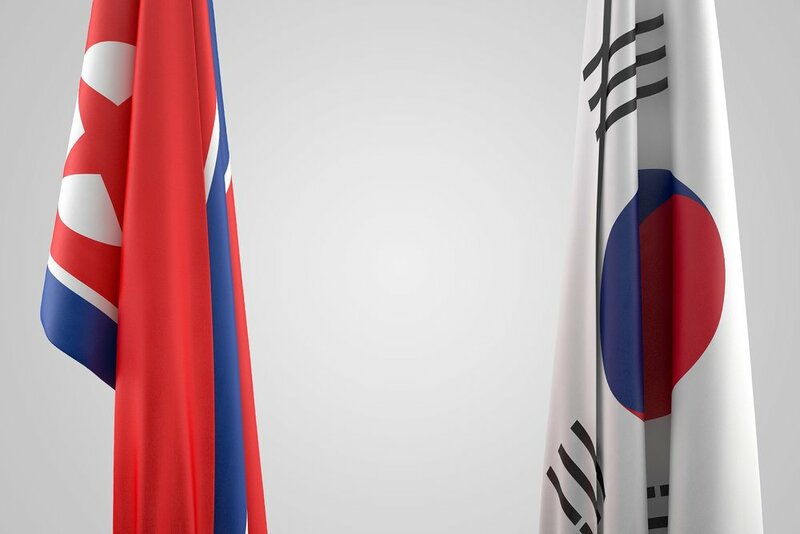 North and South Korea are fundamentally different from each other, so making a political statement implies that there is some degree of political agreement which there is not. I know this is probably not the image South Korea was trying to portray by any means, but I do not think it was a wise political move to make, not a personal gesture, but a gesture on the national level that implies some type of unification. There is nothing like that present in the way North Korea currently exists.